Augustine Chacon (18? ?-1902) – A vicious killer who operated on both sides of the border, Chacon boasted that he killed some fifteen Americans and 37 Mexicans. Captured, he was sentenced to hang at Solomonville, Arizona; however, just before his sentence was to be carried out, he managed to escape to Sonora, Mexico. However, hot on his tail was Arizona Ranger Captain Burt Mossman. Determined to track the elusive killer, who was becoming a local folk hero, Mossman enlisted the help of two ex-lawmen turned outlaws, Burt Alvord and Billy Stiles, to trap the elusive Chacon. 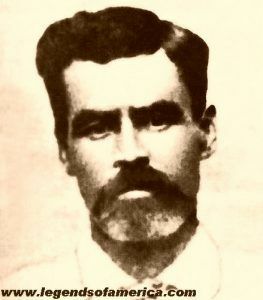 Alvord, who was an ex-lawman turned outlaw, was also hiding in Mexico and Mossman knew that Alvord wanted to return to the states. Striking a deal with Alvord and Stiles, the Arizona Ranger offered to testify to their good behavior if the two would help him locate and capture Chacon. Before long, a meeting was set up with Chacon where Mossman posed as a cattle rustler and got the drop on the cagey outlaw. Bringing him back to the states, Chacon would not be able to escape this time and was hanged in Solomonville, Arizona in December, 1902.